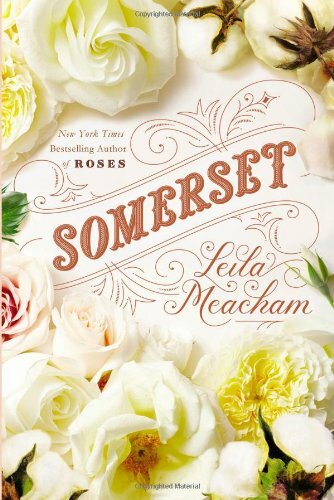 The throughline of Leila Meacham’s epic historical romance Somerset is a curse. When Jessica Wyndham, abolitionist daughter of South Carolina plantation owner and slave holder Carson Wyndham, assists in the escape of a runaway, she so dishonors her family that she has to either be married off to Silas Toliver and spirited away to Texas or be sent to a convent. Wyndham knows Silas has been cut out of his father’s will, granting the family plantation entirely to his older brother, Morris, and that Silas has no means, only the dream of founding a family dynasty in Texas. The problem is that Silas was already engaged, but Carson makes him a bargain: He will pay for the young man’s travels and expenses to get him set up on his own farm if he breaks his engagement to the woman he adores and marries Jessica instead. Some believe in the curse and some don’t, but no one can doubt the impact of illness, death, and drought visited on the Toliver family from that day forward. The two families that are chiefly involved in the novel trace their lineages back to the English War of the Roses. “The Warwicks of South Carolina hailed from the House of York, represented by the white rose,; The Tolivers, the House of Lancaster, symbolized by the red.” Such things are very important in the antebellum South where the novel begins in October of 1835. Mark Twain once observed that if it had not been for Sir Walter Scott there would have been no Southern culture, and the truth of his observation is keenly described in the opening chapters. The South is as close to a feudal economy as possible in the New World in the 19th century. The plantation system is very much like the manors of England with the ladies, lords, overseers and the serfs or in the United States, the slaves. A family name is precious and any dishonor to that name is met with harsh penalties. There are many ways to being dishonor to a family name but one of the chief ones is to gain a reputation as an abolitionist, for that is seen as a betrayal, not only of the family, but of the entire culture. And that is where Jessica Wyndham goes awry. He then proposes the “deal with the devil” which will send her as Silas Toliver’s contract bride into the western territories, out of South Carolina forever. All of the pioneers readily agree as well on a name for the place, a corruption of “How ’bout chere” that becomes in time the town of Howbutker, Texas. Okay, here we come to a major difficulty in the novel. The characters make their life decisions far too easily, so easily that it seems fatalistic. The resolutions of the conflicts seem preordained. Silas Toliver is also a slaveholder and plans live as such in Texas, building his plantation with slave labor. Jessica agrees to keep her abolitionist feelings to herself and not influence what children they may have, and in return he will treat his slaves well. It is this ease of decision on both sides, as well as the ease with which all the people in the novel seem to succeed in their various ventures, whether a cotton plantation, a department store or a lumber business, and all become fabulously rich that marks Somerset as an historical romance having more in common with Margaret Mitchell than Leon Uris. It is well plotted and filled with interesting, if idealized, characters whose company we enjoy for some 600 pages of narrative. All of the characters are deucedly handsome, gloriously beautiful and will, of course, succeed beyond all expectations. Most of the grittier elements of the story, the greatest hardships, happen offstage, as it were. The beating of Jessica's abolitionist friend, briefly employed as a teacher, the War for Texas Independence, which is a done deal before Silas sets out, the American War between the States, all occur elsewhere and we see the effects second hand or just after the fact. Also, the struggles to build, plow, plant and create the wealth the Tolivers and their companions achieve in Texas happen between chapters. Perhaps that is necessary since the novel does cover three generations, from 1835 to 1900 but we do often long to see more of the struggles that the settlers have to overcome. Then there is the curse. At times, the Toliver line does, indeed, seem cursed. Untimely death is a regular occurrence and many feel it is the sacrifice that is necessary to preserve the plantation that Silas called Somerset, after the Earl of Somerset in England from whom he is descended. These deaths do hang over the fortunes of the family, but they persevere and succeed in spite of the suspicion that Mother Elizabeth Toliver may have something to do with their misfortunes. Yes it is an historical romance but it seems Somerset doesn’t aspire to more. If it is entertaining and informative, we cannot fault it for not being enlightening and inspiring. Taken for what it is, it succeeds wonderfully. It is a great read. The historical elements, although often acting as mere backdrop for the changing fortunes and relationships of the characters, are well researched down to the minutest detail of fashion, farming methods and implements, social customs and attitudes both in South Carolina where the story begins and in the undeveloped territory of Texas. As a source of information it succeeds wonderfully in bringing the era colorfully to life, presenting a slice of history not often covered in fiction. History buffs will enjoy it on that level as much as anything else. This is the second novel about the Tolivers and Warwicks that Meacham has authored and is a prequel to the first, the well received Roses. If Somerset is a bit formulaic, it is still a novel those who loved Meacham’s other books will relish.